On our third and last time in Kyoto, The Missus and Kat were possessed of a single purpose: wearing fancy kimonos. 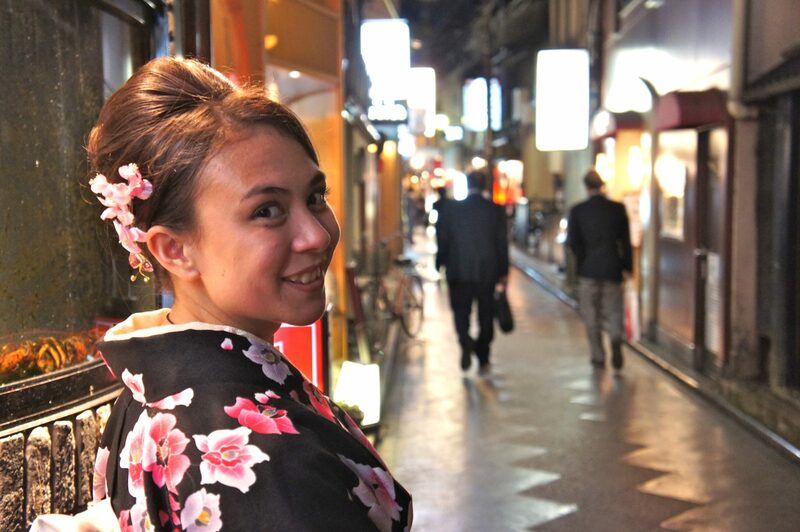 We also planned on seeing the sights and introducing Shawn to our favourite parts of the city, but all of this was secondary to our central kimono-related goal. 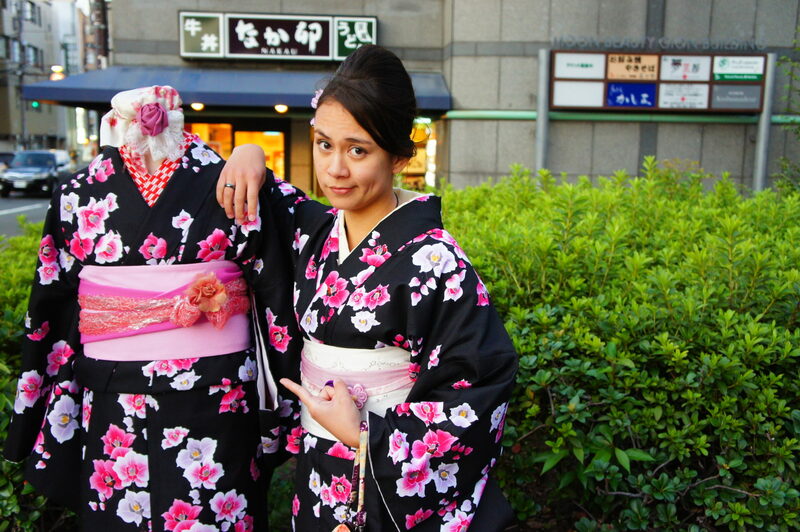 Fair warning: This post consists primarily of photographs of The Missus in a fancy kimono. Occasionally there will be photographs of Kat in fancy kimonos (including an especially fancy mid-day costume change! ), but for the most part this post is an extended exercise of my spousal prerogative. 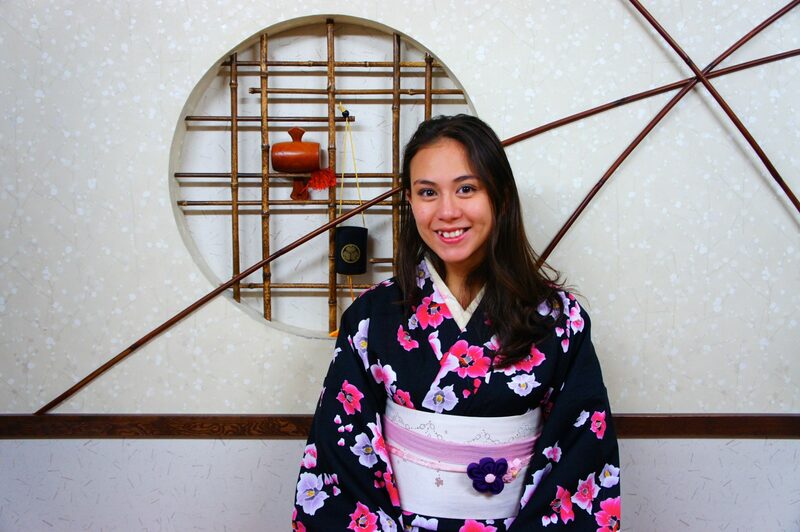 Our first destination was, of course, a kimono rental shop. It was a pretty fancy place, which we took as a good sign. We had many fancy options to choose from. 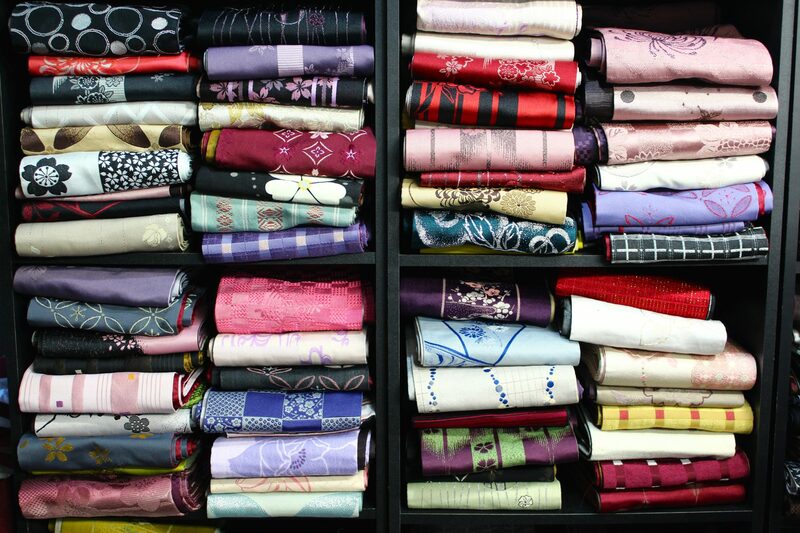 The Missus and Kat selected their fabrics and assistants began to construct their dresses. Shawn and I were ejected from the room; although The Missus and Kat were each wrapped in several layers of clothing (far more than they were wearing when they had entered! ), the assistants were adamant that they were in their “underwear”. Men (and cameras) were not allowed in the dressing room until the kimono was fully assembled. The result was very nice — fancy, even! 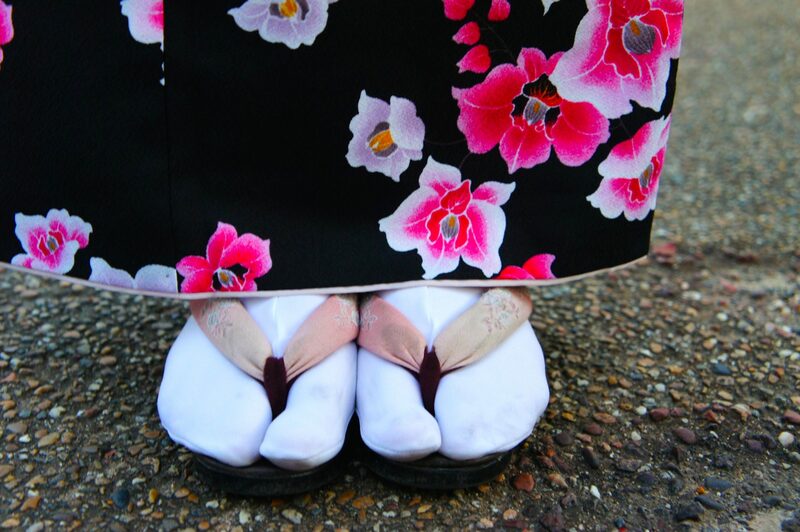 There is more to wearing a kimono than merely being dressed in a kimono, however. The ladies also signed up for hairdos to match their newly fancy attire! They had to wait a few minutes before the hairdresser would be ready, so The Missus and Kat took the opportunity to pay. 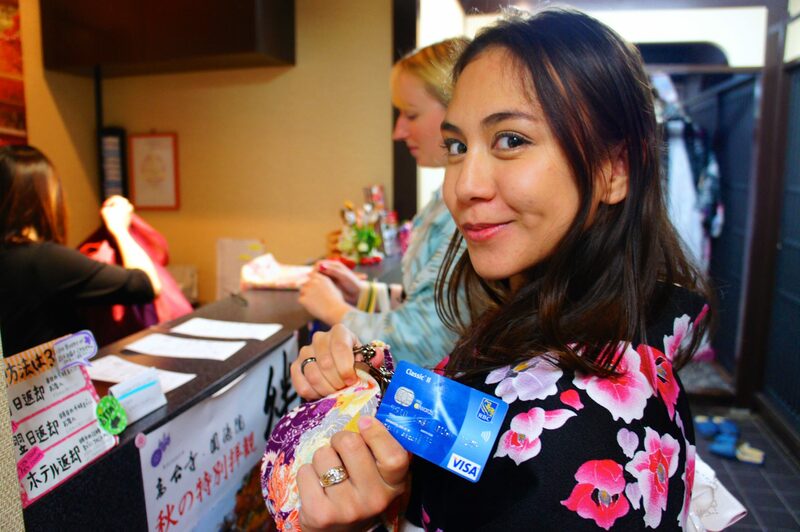 Tourist-oriented businesses are some of the few in Japan that take Western credit cards. The Missus and Kat proceded to get their hair done. The Missus raves about this hairdo to this day. 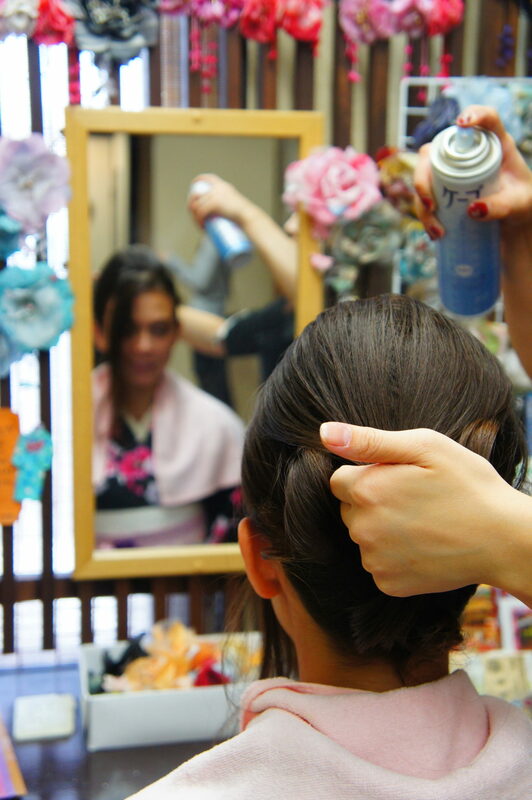 Unlike her wedding hairdo, which took two hours and more than a hundred bobby pins, the wizards in the kimono studio’s hair salon put her hair up in fifteen minutes and inserted a mere four pins. The results were even fancier than we’d expected. A fancy lady in a fancy dress. The ladies got to wear their kimonos all day — the drop-off time was the next morning. So, naturally, we set out in the direction of an ancient and beautiful temple, as is our wont. Amazingly, the first photo of Kat that I have for the day. The interior of the bus did not have professional photography lighting, unfortunately. We were headed towards Rokuon-ji (meaning “Deer Garden Temple”), but it is better known as Kinkaku-ji: “Temple of the Golden Pavilion”. 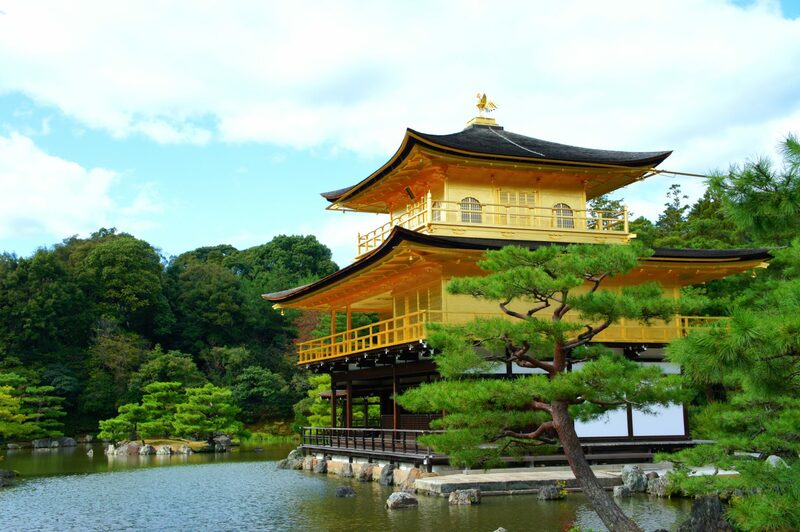 It may not surprise you to discover that the temple boasts an impressive golden pavilion. Kinkaku, the eponymous golden pavilion. This is one of the more popular tourist spots in Japan. Photos of tourists standing along the side of the pond abound. Heck, one of the partners at my law firm hangs a photograph of the golden pavilion in his office that’s almost identical to the one featured at the top of the page. Not being the type of break with tradition, we also got some snaps in with the flashy edifice. The first of a totally-original series of photos. The most enthusiastic of our Kinkaku photo series. Having seen what we had come to the temple to see, The Missus and Kat spent some time goofing around on the grounds. In a dignified way, of course. 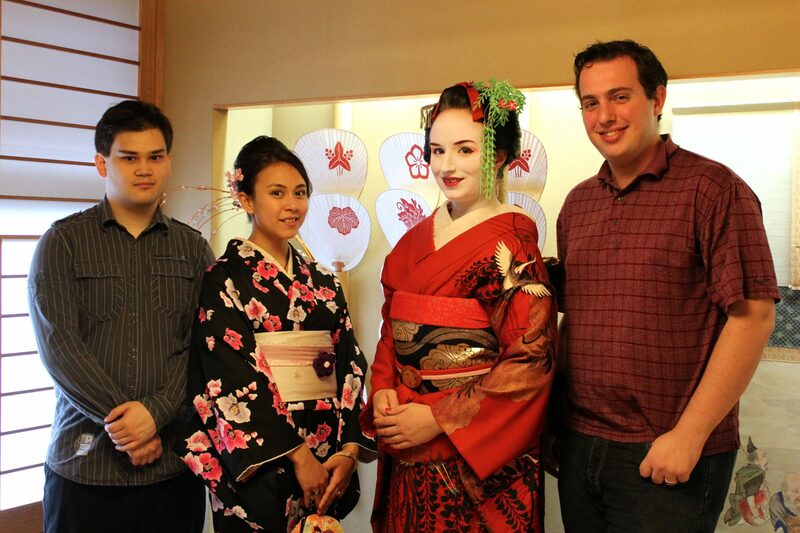 Kat really managed to glam up that kimono. A class pair taking a classy walk. We soon left the main grounds of the temple and began to pass through the shops outside. Kat found that she was very popular with the local ladies — including some who were similarly clad! These schoolgirls seemed pretty excited to get a photo with the kimono-wearing foreign lady. Wait, which one is Kat? We headed back towards downtown Kyoto, in the direction of Kiyomizu-Dera (the “water temple” that we’d visited previously). We had plans to revisit the temple with Shawn, but there were two intervening events. 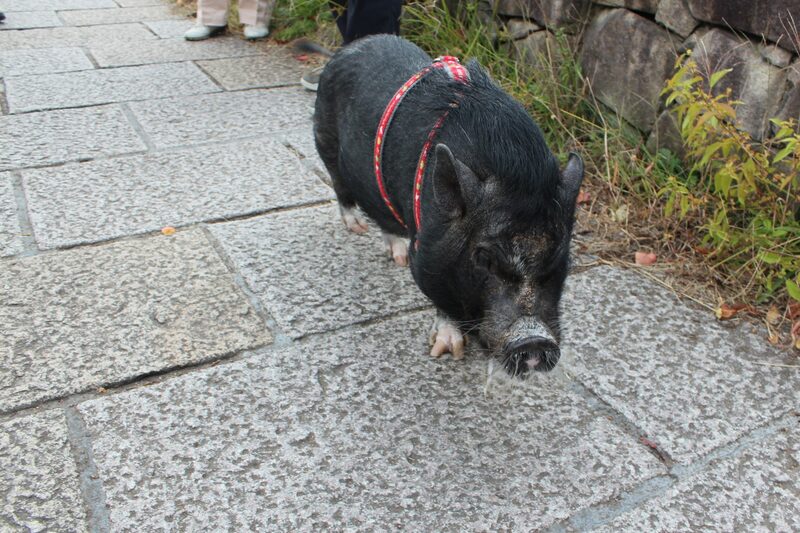 The pig and its owner were just hanging out on the street, as if we weren’t going to stop to coo at it. The second was Kat’s plan to go to a professional photography studio for formal portraits. The studio that she had in mind was just down the hill from Kiyomizu-Dera, so I kept her company at the studio while The Missus and Shawn took a tour of the temple. Kat and I didn’t have a terribly fun time at the studio. Kat had an appointment, but ended up waiting well over an hour before being seen. This wouldn’t have been so bad (since, after all, sometimes schedules fall through), but every time we asked how much longer things would take we were promised that it would be only five more minutes. These were solemn, swearing-up-and-down oaths of a five-minute timeline. When we did eventually make it in, the session itself was also quite lengthy, since it involved installing Kat into another kimono, applying traditional makeup, and actually taking some photographs. The whole affair took almost three hours, meaning that we lost a fair amount of the afternoon and missed out on Shawn and The Missus‘s adventures. Kat found that irritating enough, but was truly incensed at the notion that her chain was being yanked by an attendant with an honesty deficit. Fortunately, the photos themselves were gorgeous. It’s hard to stay mad when the results are this good. Not impossible (I am still complaining three years later, after all), but definitely hard. The smile looks genuine, but behind the eyes: rage. This kimono was much more to Kat’s liking than her previous one, which I think she found a little plain. No snark, I really like this shot. Given the circumstances, giving Kat a weapon was a brave choice. The hair topiary is a nice touch. The Missus and Shawn returned just in time for the photos to get wrapped up. We took a group shot, I snapped a few photos of The Missus with some of the props (spousal prerogative, remember), and Kat got changed back into her rental kimono. It really is quite a nice kimono; unfortunately, this one didn’t leave the studio. The first place we’d seen Japanese ladies in kimono was at Kiyomizu-Dera. We were eager to make up for lost time, but we could not move on without making good on our oath to return to the water temple kimono-clad. 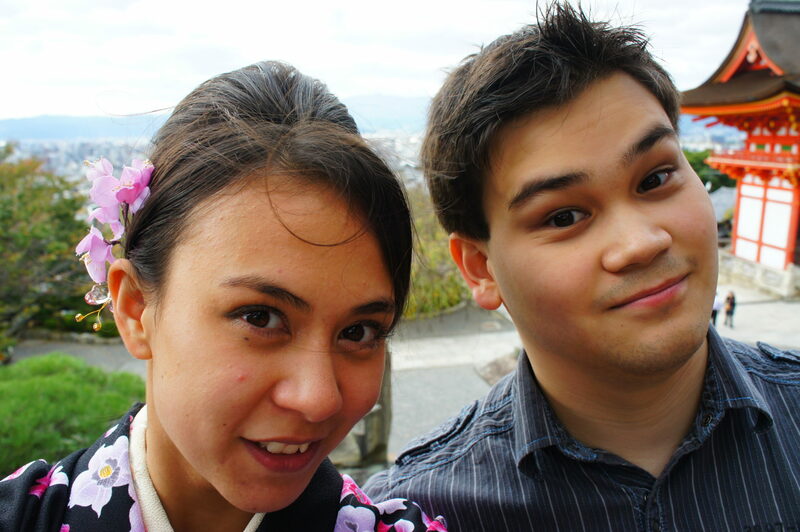 We ran up the hill to Kiyomizu-Dera for a quick photoshoot. In this photo’s more scandalous sibling, she’s smooching me on the cheek! Amelia sported this fine floral fixture all day. We made our way down to the lower portion of the temple as the sun began to fall towards the horizon. Kat snuck a few photos in near the lantern halls. Kat found the ripening light to her liking. The kimono-clad ladies at the lantern hall. We spent altogether too much time gawking at this duck. Being near the duck was a very intense experience for Amelia. After our impromptu photo session in the park with our feathered friend, we tromped back to the rental studio to drop off Kat’s kimono, as she was eager to return to her regular clothes. The Missus was still keen on her kimono, so she kept it on and planned to return it the following morning. We then set off in the direction of Issen-Yoshoku. It was actually quite a pleasant walk, which is remarkable considering that The Missus spent the whole day walking around Kyoto in formal sandals (which have an unfamiliar forward-sloped platform shape). I wonder what the Japanese word for “thong sandal” is. The walk to the restaurant was uneventful, although The Missus did find a someone wearing a kimono with the same pattern as her. Ordinarily this would be cause for some embarrassment (or, at least, that’s what Sweet Valley High has taught me), but in this case The Missus didn’t seem too concerned about the competition. Before long we arrived at Issen-Yoshoku. The restaurant has a quirky sense of humour. For instance, a sign outside advertises “five smiling girls in kimono inside who are famous in Kyoto for their beauty.” The joke is that, like The Missus’s kimono companion, the “smiling girls” are mannequins. They’re seated around the store, surrounded by brightly coloured signs, lanterns, busts, statues, and so on. The atmosphere is riotous. Normally I’d include a photo of the interior of Issen-Yoshoku here, but it, uh… might not be entirely appropriate for a family-friendly website such as this one. Some of the decorations were more ribald that is typical for my blog. Or perhaps I was so fixated on The Missus that I neglected to take any other photos worth sharing; it does seem like other visitors have taken perfectly appropriate photos of the restaurant’s interior. The other notable quirk to this restaurant is that Issen-Yoshoku’s comically large menu contains only one dish — a specific variety of okonomiyaki. The menu uses its leftover space to list the various ingredients in the dish, describe the distinctive “savoury pancake” to unfamiliar guests, and reassure wary foreigners that okonomiyaki is quite popular with “people from overseas”. They know what they’re doing — it was delicious! The prices were more than fair; we were expecting inflated sums for spendy tourists, but each order of okonomiyaki was only about $6. There really isn’t a downside — I strongly recommend that you visit Issen-Yoshoku if you happen to find yourself in Kyoto. Now, before we proceed, I need to share an important series of photographs with you. Over the course of the day, The Missus had been eating food (as is traditional for human persons both in and out of kimono). Now, I am not sure that any photograph can fully convey the joy of witnessing a ravenous (but diminutive) The Missus devouring oversized foods in a fancy kimono. But I would be shirking my duty to you, the reader, if I did not try. So: behold! Who knew that Haagen-Dazs was a traditional Japanese food? Ok, we can resume our story. 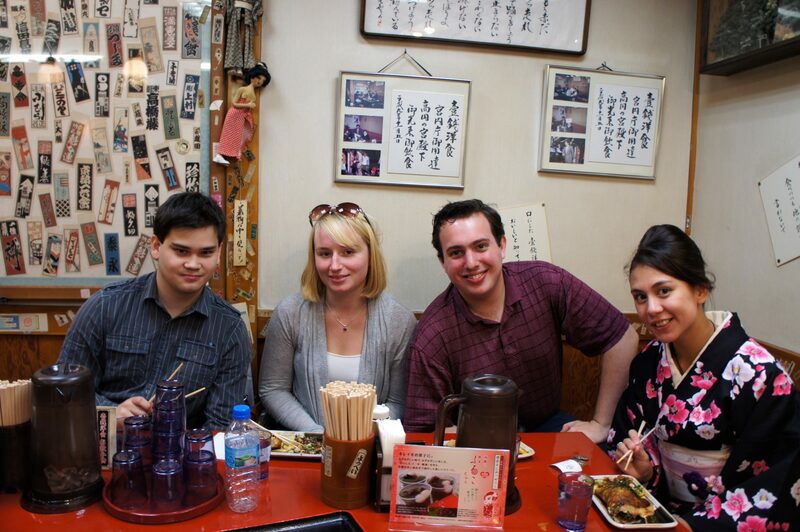 We had a lovely time at Issen-Yoshoku, and vowed to say nice things about it on the Internet. Three years later, our blood pact is fulfilled. As you may recall, Issen-Yoshoku is located in the historic Gion district, where traditional Japanese architecture, art, and fashion are on prominent display. This seemed like a good time to revisit Gion, partially so that Shawn could see it for the first time and partially to take advantage of The Missus’s traditional garb. Our first stop in Gion was a traditional vendor of fine Japanese beverages. By which I am obviously referring to Starbucks, home of the green tea latte (which I understand to have introduced green tea to Japan). Issen-Yoshoku had fantastic okonomiyaki, but was a little short on lattes. Plus, we’d been travelling for a while now and were eager for a taste of home. It was then, when we were ensconced in familiarity and our guards were momentarily down, that disaster struck. One of Kat’s lenses took a tumble and split its glass, rendering it totally useless. This was distressing, and threatened to put a damper on the evening. We decided that the photography portion of our evening was over. We headed back to our hostel, where The Missus changed back into her civvies and bundled up her kimono fabrics. 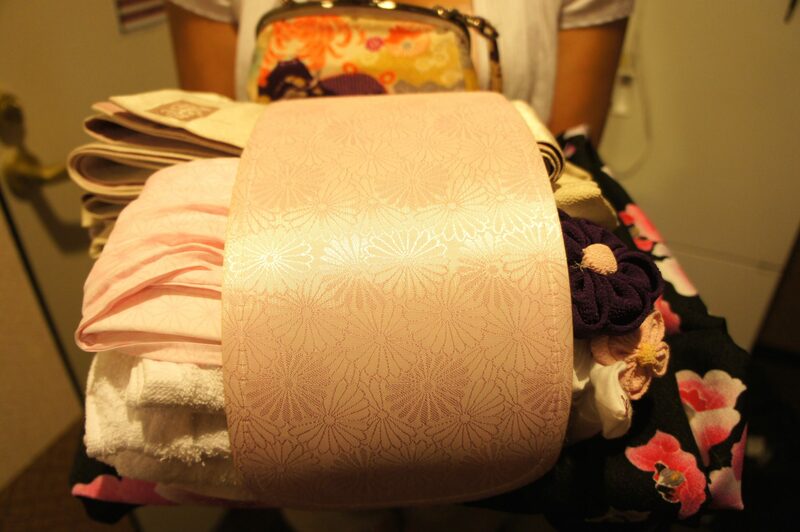 A kimono has a lot of layers. We didn’t want to end the day on a sour note, though. Not just for Kat’s sake, but also for Shawn’s — this was his last night in Japan! We knew that we needed to find something fun to do, and as luck would have it we knew just the place. It took less than a minute to walk down the alley to the ¥300 standing bar that had welcomed us previously. We were glad that we did. By this point, we considered ourselves regulars. Amelia decided to intrude on Shawn’s personal space, but only a little. Kat intruded on my personal space, like, a lot. This is sort of her Thing. We were out very, very late and had a very, very good time. With the evening effectively salvaged, we found our way back to our hostel (remember: only a few feet away) and turned in for the night. We needed our rest; the next two days would be our last in Japan, and there was so much still to do. 7 March 2015 11 February 2018 Christopher ScottComments are off for this post.